Every time I see yet another article about the Amazon vs. Hachette stand-off that paints Amazon as a bully, I wonder if we really have become too lazy to think, or if it is just too tempting for even renown websites to give in to the temptation of sensationalism it creates, because when you look at what is really happening, nothing could be further from the truth. The sentiment that Hachette may be a poor victim in this scenario is incomprehensible to me. Not only is Hachette neither poor, nor a victim. Amazon does not target individual companies, singles them out and then tries to destroy them by refusing to sell their products. Quite the opposite is true, actually. Amazon is dealing with hundreds of thousands of individual vendors and suppliers and not once in its history has it singled out any of their vendors with the kind of vindictive action that is constantly being suggested here. If anything, Amazon has always been an incredibly fair, flexible and forward-thinking partner to all its suppliers. Let us not forget before we get deeper into this, that Amazon has single-handedly not only saved, but revived the book market not too long ago. Amazon has created a platform for authors to flourish, for books to bloom and all while making money for everyone. Evil? I don’t think so—unless you’re a conspiracy theorist. There are more active and published writers today than ever. There are more books on sale than ever. There are more books being sold than ever, and there are more books being read than ever, I presume. Let’s make no mistake. Before Amazon made all of this possible, the book industry was not only stagnant, it was dying. Fast! Meanwhile, the old-school business model of the Big Five publishers is dying still. Companies like Hachette simply do not have a grasp on the reality of book publishing in 2014. They are not adapting and as a result they are no longer needed. They have become a side show in a world where everyone can publish, where anyone can become a bestselling author. I am not saying they are obsolete, but they are no longer relevant and with every year going forward, they will be come increasingly marginal. The fact how long this stand-off is lasting already, is a clear indication that Hachette is unwilling to bend, and clearly underscores who the real bully is. They could have agreed to Amazon’s standard publishing agreement for weeks now and would have continued to sell books, but they refuse to do so, expecting Amazon to make special arrangements for them. That is not very rational in anyone’s mind, and shows that Hachette is not even trying to resolve the problem, particularly when every blogger and journalist seems to be all too happy to support their sensational truth-contortion. Hachette is acting like their jockstrap is pulled too tight. They seem to have this inflated opinion of themselves that makes them believe that they look all potent, yet at the same time they are too proud to admit it hurts. And hurt it does, but if Hachette is determined to self-destruct, I’m all for it. Whatever floats their boat. Amazon does not need Hachette, but Hachette most definitely needs Amazon to sell their books. So what is the real conflict between Amazon and Hachette, actually, once you peel away the vitriol. In my experience, in cases such as this, there is always a backstory. Something that happened long before Amazon reverted to what could be considered flexing their muscle. What Amazon does is very clearly a reaction. A response to something that happened before and left them little choice but to go on the offensive. Since the previous discussions and negotiations that have taken place between the parties are not being disclosed, we may never know what went really down, but I think it is not too far fetched to imagine that Hachette was not happy with the status quo and tried to force Amazon to comply with its wishes, guided by the sense that as one of the largest international publishers they could somehow force Amazon’s hand. What they failed to see was that Amazon could not care less about Hachette. It makes absolutely no difference to Amazon whether they sell Hachette books or not. With millions of other titles available in their catalog, Hachette is a mere speck on the map. What’s even worse is that Hachette quite obviously forgot that Amazon controls the channel. Amazon sells the majority of books worldwide and as a result they control the terms. Like Wal-Mart, they do not negotiate with their suppliers. They have standard agreements that tell vendors what they need to do and what is expected of them, and if the vendor feels he can’t agree to these terms, Amazon won’t sell your products. It is as simple as that, and it is the vendor’s choice—and consequence. If a publisher like Hachette thinks they can manhandle Amazon, they’ve clearly got another thing coming—as we are witnessing right now. Does that make Amazon evil? Not at all. If anything, it only shows once again, how removed publisher like Hachette are from the realities of being a book publisher in 2014. What we are witnessing is a decision on Amazon’s behalf to protect their business, to ensure they remain the most successful online store with the highest customer approval ratings on the planet. Hachette, by comparison… not so much. How anyone could see Hachette as the good guy in all of this is inconceivable to me. It is not like the publisher has a track record of good behavior. In fact, this is a publisher stuck in an antitrust suit, currently being subject to a court order to renegotiate terms with retailers because they have been found to have artificially inflate prices. And that is just the tip of the iceberg. Naturally in a stand-off such as this there is collateral damage, and in this case it’s the authors published by Hachette whose books are currently unavailable at the largest book store in the world. However, for these authors to simply claim that Amazon is evil because they are responsible for lost sales, is really not looking the facts in the eye. Some of these authors complain that the loss of revenue destroys their livelihood. I am not entirely unsympathetic to this, but it is a problem we are all facing on a daily basis, so my answer to those authors is, if your livelihood depended on your Hachette book sales, perhaps you signed the wrong contract. You should have asked Hachette for proper guarantees, instead of giving them carte blanche and assuming they would always act in your best interest. Isn’t it rather naïve to be under the illusion that Hachette has any interest in protecting an author’s best interests? This is a company that has, for generations, made a business of bullying writers out of royalties, squeezing every cent out of their creative pool that provides the actual content for their business—meaning the authors—and then having the audacity to pretend it is all warranted and good business. Sorry, not following here… missed a turn somewhere. By signing your current contract, you have allowed a book publisher to corner you, fob you off with a meager 25% or 30% royalty rate, making no guarantees whatsoever, making absolutely no commitment to you, delaying payments as long as they legally can. You signed the contract! It’s your own fault. You forgot one very crucial fact about the industry—Amazon is selling books, not Hachette. Hachette is a middleman, and of dubious reputation to boot, whose business relies one strategic partners. They antagonized their key partner and you are the pawn in all of this. Hachette is counting on you to be upset, you are their muscle—or so they believe. At the same time you have absolutely no way of controlling your destiny. You have signed away your rights without any chance of recourse, giving a bully free reign. So, don’t complain to the world how bad Amazon is. Try to be honest to yourself and face the music. You brought this upon yourself. Just earn from it and make better decisions next time! But all contracts are like that, right? It’s the industry standard. This must be the lamest excuse ever. Only because authors allow publishers to exploit them doesn’t make it right, and authors could have changed things a long time around. There is strength in numbers and if authors would collectively refuse to give up their rights for a few bread crumbs, publisher would have had to raise the bar and offer better business terms a long time ago. But as it stands, there is always some desperate soul out there who’s willing to sell their book for chump change, just to see his name on a printed book published by an extortionist. Strange, I know, but I tell it how I see it. And the weirdest thing is that big names like Stephen King and James Patterson are actually among those people advocating this practice. Then again, not so strange, perhaps, considering that their publishing terms are much more favorable than yours, and that unlike you, they have the full backing of their publishers. Meanwhile there is a flood of books coming out from writers who self-publish. They make more money per sale, they have full control over their books, they have full ownership in their books, and some of them even break out and sell millions of copies, managing their own destinies. It is an option that was open to all of Hachette’s authors as well, so once again, if you signed a cutthroat contract that leaves you hanging out to dry in this time of crisis, it certainly isn’t Amazon’s fault. In addition, Amazon has released a statement on the subject some time ago in which the company even outlined plans to subsidize affected authors, provided that Hachette does the same thing. This put the ball squarely in the publisher’s court and yet, Hachette did not react to it. Instead they bought another publisher, Perseus Book Group, in order to gain leverage in their position against Amazon. Hahahaha! Earth to Hachette—you’re no longer relevant in the book world, and in case you didn’t notice, you are nose-diving! So far, the overblown reactions to this confrontation have had a very orchestrated feel, to the point that you wonder if Hachette was actually buying off the media to build sentiment against Amazon. Leaked emails that Hachette sent to its authors seem to substantiate this, in which the publisher clearly contorts truths, and hides relevant facts and information even from the heart of its operations, the authors. So, ask yourself? Who is the bully? The kid who keep pushing others around, posturing, threatening, intimidating, or the kid who eventually stands up for himself and fights back? E3 exhibitors afraid to show you their games? As many of you know, I’ve been a game developer for most of my life, and my career in the industry goes back over 30 years. As such, I have seen trade shows come and go, and I was there when the Electronic Entertainment Expo, now universally known as E3, was first conceived as the industry’s replacement for the Chicago CES show. 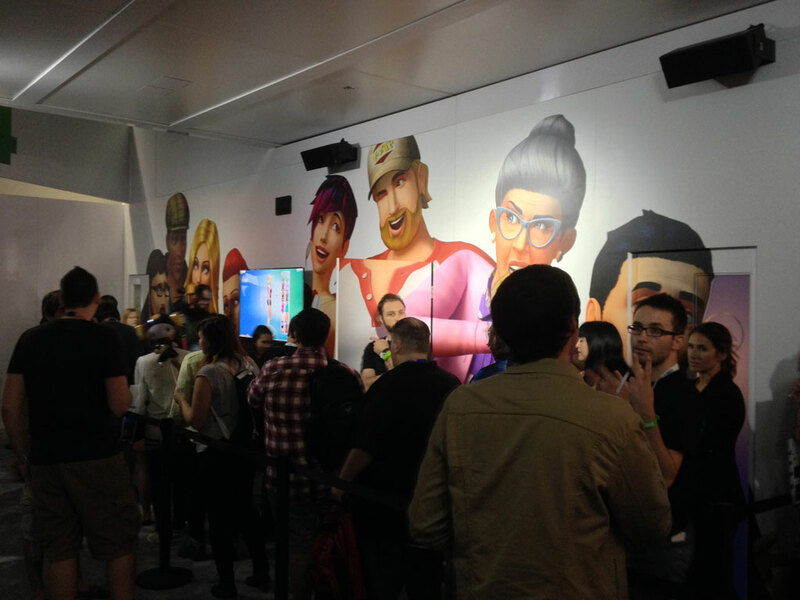 For the past two or three years a strange trend has permeated E3, one that is unique to this particular trade show. 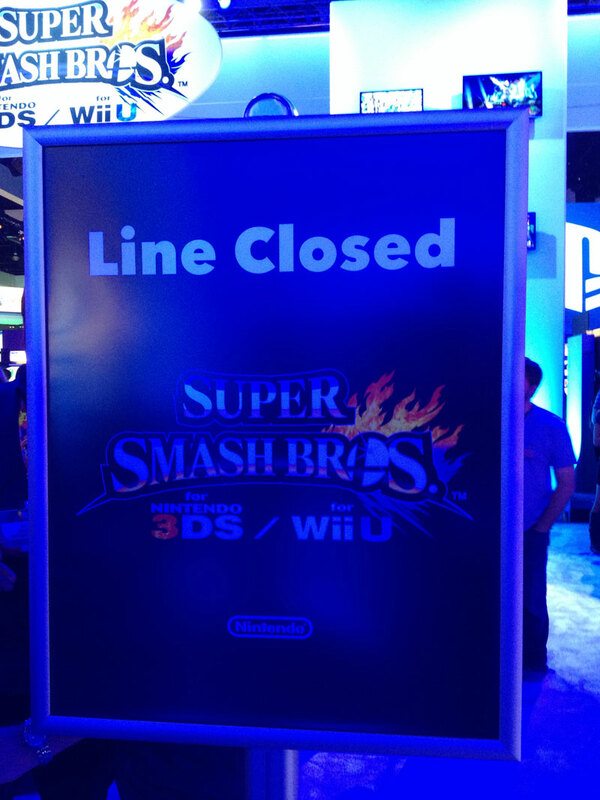 Exhibitors would take their showcase games and no longer display them on the show floor. Instead they would isolate them in a separate room in the actual booth, allowing only a few people inside to see the game, in the course, forcing people to line up to wait their turn. SquareEnix was probably the first company to do this, years ago, to show off the latest “Final Fantasy” entry and over time other publishers adopted the practice. Well, this year it took a turn for the extreme, because if you were visiting E3 this year, the odds are you didn’t even see half the games that were on display. Instead you saw theme-park-like waiting lines in virtually every major publisher’s booth. 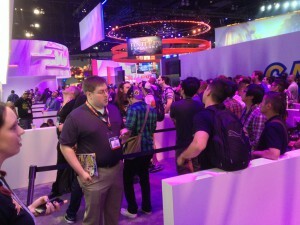 In fact, half the booth space of exhibitors, such as Warner Interactive, consisted of nothing but roped-off waiting lines. Take a look at this picture. The entire length of the booth consisted of people waiting in line to see one of Warner’s top games. Because I was curious I actually decided to get in line to take a look at “Shadow Of Mordor,” the latest “Lord of the Rings” game, waited in line for almost 30 minutes, only to find that my line was cut off four or five guys ahead of me. Unable to get into that presentation I would have had to wait another hour to see the next one! Sorry, folks but that is just ludicrous. 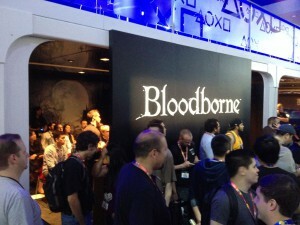 Or take a look at the presentation of “Bloodborne” at the Sony booth. The publisher deliberately placed the screen inwards so that you could not see the presentation from the outside. How backwards is that? Do you want people to see the game or not? How hard would it have been turn the booth 180 degrees and allow people walking by to see that game. It would have resulted in tons of additional exposure, but no, it is much more important to have people line up, clutter the rest of the booth and create a traffic block. Well done, guys! What’s even more ridiculous is that some exhibitors made people line up to even check out games that have been already released. Electronic Arts, for example, forced people to line up, just to get their hands on “Titanfall,” an action shooter that was released three months ago! EA has never been known as a company with a lot of common sense, but this certainly scraped the bottom of the barrel. This, of course, begs the question, are publishers afraid to show you their games? Not really. The answer is actually much simpler. It is sadly as juvenile as the games most of them make. It all has to do with the opinion most publishers have of themselves. You have people in their marketing departments whose job it is to create excitement around the games they sell, and you have the executives of these companies whose job it is to turn a profit and make the shareholders happy. When you talk to these people, they all have one thing in common: They all think the games they sell are the best in the world and that the company they work for — which strangely changes very frequently — is the most important and influential player in the industry. In short, they live in this bubble where they make themselves believe the hype they are trying to create. What’s wrong with this statement? Well, first of all, it completely misses the point, because just because people stood in line doesn’t mean they actually got to see the game, let away, liked it. Since they never got to see the game and stood in line simply based on the assumption that the game might be interesting, to deduce that people liked the game is no more valid than saying that, with its lines and all, the DMV must be the epitome of a happy place. 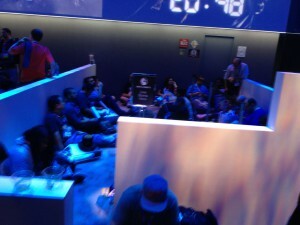 But that would predicate that people actually had the chance to witness the game as an openly accessible presentation in the booth, which was clearly not the case at E3. I didn’t see a single frame of Mortal Combat X, or Shadows of Mordor, or the new Batman: Arkham Asylum, or The Sims 4 and countless other games. And it frustrates me. Not only the fact that I went to a trade show to see the latest games, but also the fact that publisher truly expect me to stand in line for hours to see a video clip for single game, then leave, wait in line for an hour to see a clip of their other game, and so forth. In their desire to appear to be the show’s hot ticket, they mistake a waiting line for actual enthusiasm. Or then again, they do not mistake it, they are fully aware of the farce, but they are so misguided that they think YOU can’t tell the difference, because the reason they really do it is because in their mind, they believe that these lines, reflect positively on them and the game you’re trying to see. Creating this barrier, the game becomes this intangible, unreachable objective that everyone has to aspire to because if the waiting lines are so long, the game has to be so cool, right. As things go in the real world that I roamed in, the real sentiment among visitors at E3 these days is that they are disgruntled because they never even had the chance to see the game. Instead of spending the time talking to colleagues about the cool games we saw, creating real word of mouth interest, conversations around E3 were often taking place about how frustrating it is to get to see anything of interest. To assume that a visitor has an endless amount of time on their hands is completely half-baked and, frankly, stuck-up. Many industry professionals have to squeeze as much in a single day as they can, and there is no room to wait in line for hours on end. Evidently, for people who are working the trade-show booths this is not an issue because to them it is one large three-day event, but for the throngs of visitors it is not. So, in the end, exhibitors are really shooting themselves in the foot with this practice. I would have been happy to tell people about how great “The Sims 4” looks, how amazing “Dragon Age: Inquisition,” or how cool “Shadow of Mordor” seems to be, but I can’t and I won’t, because I never saw the games, and to me that is a joke. It is a sign for me that the industry has lost all perspective in its self-indulgent make-believe bubble. You either want to show off your product, or you don’t. If the latter is true, you have no place on the trade show floor, and if the number of guards, whose job it is to make sure no one’s jumping lines, outnumbers the number of presenters in your booth, you know that you definitely got something wrong. E3 is the only trade show I’ve ever seen with this kind of practice. These are not closed door meetings, which have their value and purpose, but public displays that deliberately shun visitors to create the illusion of something special. To me, that is just backfiring. It leaves a bad taste in my mouth and, quite honestly, I no longer care if “Shadow of Mordor” is any good or not. I have lost interest… good job!